"Design, Production, Integration, Test, and Delivery of Medical Simulation Technologies and Post-Delivery Activities and Services"
Attaining ISO 9001:2015 certification serves as a testament of CAE Healthcare’s total commitment to ensuring that all key aspects of our business are steadfastly aligned to consistently deliver the highest quality in healthcare simulation products and services to our customers through strict compliance with well-defined and regularly-reviewed industry standards, processes and procedures. 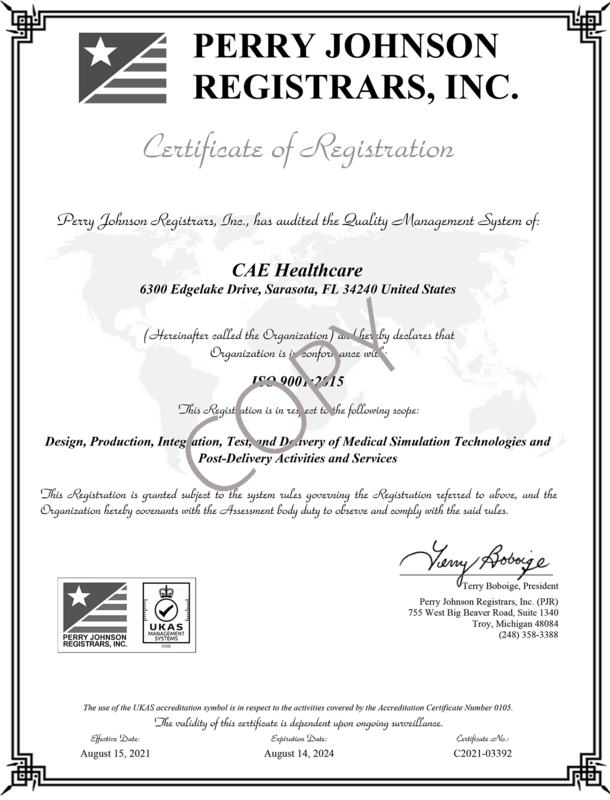 To achieve compliance with ISO 9001:2015 requirements, CAE Healthcare chose Perry Johnson Registrars, Inc. — one of the world’s foremost impartial accredited providers of management system certification services. CAE Healthcare’s ISO 9001:2015 certification has been duly recognized and is in effect since August of 2018. ISO (International Organization for Standardization) establishes specific criteria for organizational conformance to standardized rules which demonstrate an organization’s continued ability to reliably provide services and products that consistently meet client/customer expectations through application, implementation, and steady improvement of the quality management system. CAE Healthcare’s management processes adhere to the international standards as set forth by ISO Quality Services Ltd. CAE continuously measures and monitors the effective implementation of these processes to ensure consistent quality in standard operating procedures, as well as in the products and services delivered to our customers. CAE utilizes Lean/Six Sigma Methodologies for continuous improvement throughout the organization. We use Lean as a tool to improve quality at the source, and to ensure we innovate our solutions to continually improve patient safety.